Capcom has announced that Monster Hunter World will be releasing worldwide on January 26th, 2018, for PS4 and Xbox One. The company revealed the news for the latest instalment in its multiplayer action-RPG franchise at this year’s Tokyo Game Show, and dropped a new, breathtaking trailer to go with it. That's a trailer alright. My favourite moment has to be the massive, flying furball who would otherwise be adorable if it wasn’t for that terrifying, toothy face. But you’re not here to go “awwwh”, you’re here to slay monsters, and Monster Hunter World looks like it’ll be thoroughly delivering on the promise of its title. Capcom also revealed the upcoming Collector’s Edition for the game, which includes a soundtrack, art book, product code card, and detailed figurine of one of its starring monsters; Nerurigigantei (don’t worry, I don’t know how to pronounce it either). There will also be a Digital Deluxe Edition of Monster Hunter World for those who prefer to purchase their copies online, and both editions will be available to pre-order for that January 26th release. On top of all this, Capcom revealed a 'Liolaeus' limited edition PS4 Pro. It's absolutely gorgeous, with both the console and its Dualshock 4 controller decked out in gorgeous Monster Hunter artwork. A worldwide release for the product hasn’t been announced, but it’s due to launch in Japan on December 7 this year, with pre-orders going live in the country tomorrow. 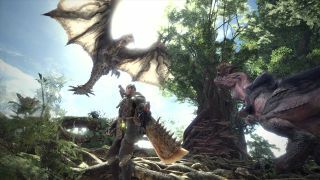 A PC version of Monster Hunter World was confirmed some time ago, but any release information for that port was strangely absent in Capcom’s presentation at the show this year. Hopefully the wait won't be too long, as the game is starting to look like it might kick off 2018 with a stupendously enjoyable bang.